for moms who feel tired all the time. and find out how you are doing – really. Mom, get ready to change your direction AND get help for dealing with the path you are on. First you will want to print off a copy of this quiz to put in your personal health file and to share your doctor. Step 1. Did you have mostly “YES” answers? Please make an appointment to see your Doctor – today. Mole hills can turn into mountains if we ignore them long enough. Use this as a wake up call to be proactive about your health and take action. NOW! Notes: Once my mother was in such pain that she went literally numb. Numb to her pain, numb to taking care of herself. I got her to a doctor just in time to save her life. Sound dramatic? Sometimes life is. Are you not getting help because you are unhappy with your doctor? Then fire him or her and see someone else. I've been there too. Step 3. Get support to help yourself. We offer a weekly energy boost newsletter, daily inspiration and empowerment, listing of self-help books and resources and an easy-to-follow pathway to recovery called the Fatigue Be Gone Guide. A step-by-step, self-help, self-discovery and fatigue recovery guide for women who are sick and tired of feeling tired all the time. If you are aware of how you feel AND want to get your life back on track NOW, this is just what you need. 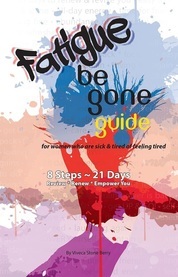 The guide will help you uncover your fatigue triggers and save your precious time, stress AND money. It's a tried-and-true shortcut to feeling GREAT - Fast. Another way to save money, is to purchase the bundle which includes the Guide and Log - daily activity tracker and food diary. Save 20% when you order together! ​dis-eases that cause you to feel tired all the time. Legal Disclaimer: Information on this Web site is provided for information purposes only. Any medical information obtained from this Web site should be reviewed with an appropriate health-care provider to determine its applicability to your particular condition. Great care has been taken to maintain the accuracy of the information provided on this Web site. However, Fatigue Be Gone, and their employees are not responsible for errors or any untoward consequences arising from your use of this information.© 2006-Present.